Medical tourism has gained popularity among those who have no insurance or whose policies require them to pay a large portion of their health costs. There are three main types of medical tourism: outbound, inbound, and intrabound. Lower costs for labor, hospital construction, government taxes, and malpractice insurance, are a few of the reasons medical care is cheaper outside of the United States. The medical tourism industry has been growing worldwide as people travel abroad for treatments and surgeries. The concept of traveling far for medical treatment is not new — it can be traced back thousands of years to when Greek pilgrims traveled from all over the Mediterranean to a place called Epidauria in the Saronic Gulf, the sanctuary of the healing god Asklepios. Beginning in the 1950s, medical tourism became popular among affluent Americans who were seeking alternative treatments for dire conditions and diseases. Today, medical tourism is not only popular among the wealthy. It has gained traction among those who have no insurance or whose policies require them to pay a large portion of their health costs. When you leave this country, you are leaving certain standards. There are three main types of medical tourism: outbound, inbound, and intrabound. Outbound is when U.S. patients travel to other countries for medical care. Inbound is when patients from other countries travel to the U.S. to receive medical care, while intrabound is when U.S. patients travel within the United States to receive care outside their region or state. In 2007, more than 750,000 Americans traveled abroad for outbound medical care, the Deloitte Center for Health Solutions reported. The center estimated that outbound medical tourism would reach upwards of 1.6 million patients by 2012, recovering from the economic recession that eroded the industry’s growth rate between 2007 and 2009. With the high costs of U.S. health care, American patients are choosing to travel to foreign countries where the costs are considerably lower. Many will travel to places like India, Brazil, Mexico, and Thailand to receive everything from cosmetic surgeries to cardiovascular surgeries. According to Medical Tourism Association data, hip replacement surgery in the United States typically costs around $50,000, but in India can cost $7,000. Heart bypass surgery that costs $144,000 in the United States is more than 80% cheaper in Costa Rica, where it costs around $25,000. Why is medical care so much lower in certain countries? Lower costs for labor, hospital construction, government taxes, and malpractice insurance, are a few of the reasons. Even with travel expenses added on, savings can be substantial for Americans getting treatment abroad. 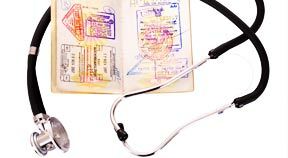 However, some say the risks of traveling to a foreign country for care outweigh the savings. In response to questions about the quality and safety of the care they provide, many hospitals worldwide seek accreditation from the Joint Commission International (JCI), the international division of the institution that approves U.S. hospitals. Medical tourism companies, such as Vernon Hills, Illinois-based MedRetreat LLC, facilitate patients’ needs to find safe and affordable health care abroad. MedRetreat was founded in 2003 and helps patients connect with healthcare providers overseas and plan their travel and accommodations. The company has developed a network of advanced health care organizations accredited by JCI and affiliated with hospitals in the U.S. Many of the doctors in the MedRetreat network were educated in the U.S. Some have even practiced and remain board certified in the U.S. Importantly, MedRetreat representatives personally travel to all the overseas affiliate facilities to make sure that their reputation is well founded. In addition to learning about the country and facilities in which they will receive care, patients must get details about the physician administering the care and the particular surgical procedure they will be undergoing. This can help them avoid post-surgical complications and ensure successful outcomes. People will travel for a procedure under the impression they will be there for a short period of time, but what happens when it becomes an elongated stay because of complications? “If you cannot get comfortable where you are, that is problematic,” Rose says. Marsek says the time a patient spends overseas is usually 14 to 17 days, including the average three-day hospital stay, but sometimes this can be extended much longer depending on the outcome of the treatment. While lower costs for health care overseas can be an attractive option, people should plan carefully before embarking on medical tours.